Classic styling and smart features help define this luxurious Range Rover Sport. 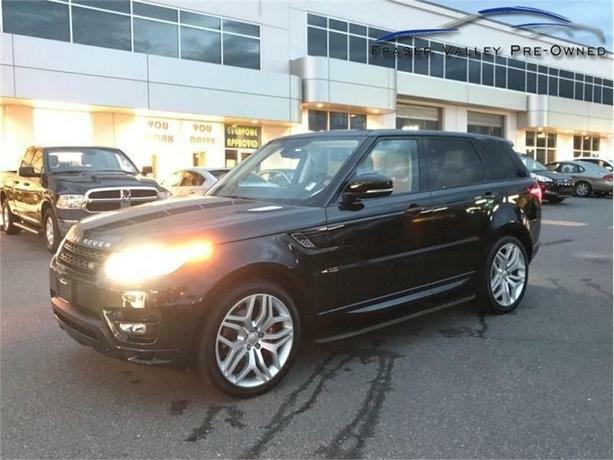 This 2015 Land Rover Range Rover Sport is fresh on our lot in Abbotsford. This Range Rover Sport was designed to be driven. Agile and responsive, its breathtaking performance is matched only by its distinctive design. A breadth of capability and driver-focused technologies make this Range Rover Sport the most dynamic Land Rover yet. This low mileage SUV has just 6880 kms. It's black in colour. It has a 8 speed auto transmission and is powered by a 510HP 5.0L 8 Cylinder Engine. It may have some remaining factory warranty, please check with dealer for details. Buy this vehicle now for the lowest bi-weekly payment of $540.10 with $0 down for 84 months @ 4.99% APR O.A.C. ( Plus applicable taxes - Plus applicable fees ). See dealer for details.